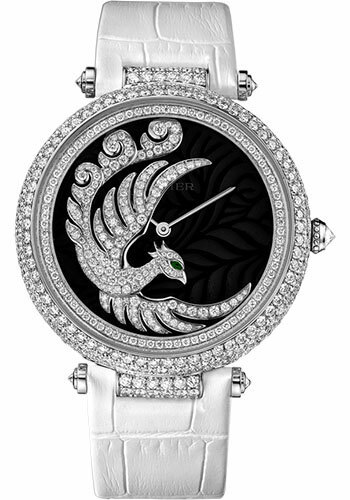 42.75mm 18K white gold case set with 400 diamonds, 11.40mm thick, sapphire back, pearled crown with a cut diamond, sapphire crystal, dark purple mother of pearl dial with Phoenix oscillating mass complication in rhodiumized 18K white gold set with 162 brilliant-cut diamonds. Eye set with a tsavorite., caliber 9603 MC automatic movement, approximately 48 hours of power reserve, white alligator strap, double folding buckle with 18K pink gold set with 43 brilliant cut diamonds. Water resistant to 30 meters.